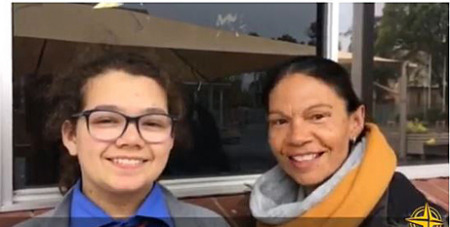 The significant contribution Aboriginal and Torres Strait Islander women have made to Catholic education in Wollongong has been highlighted in a video produced by students for NAIDOC Week. Source: Illawarra Mercury. Almost 40 Aboriginal and Torres Strait Islander students from seven of the Wollongong Diocese’s schools contributed to making the video. Director of Catholic Education in the Diocese of Wollongong, Peter Turner paid his respects “to the many wonderful Aboriginal and Torres Strait Islander women in the Wollongong diocese”. “This year’s powerful NAIDOC Week theme - Because of her, we can! - certainly applies to them,” Mr Turner said. “In particular this year we come together to celebrate the women behind those stories. Those very significant women who brought us to where we are today. “We still have much to do to close the gap, to bring about justice, to bring about healing and to do something about the wrongs of the past. “To all the Aboriginal and Torres Strait Islander women in our communities, I say to you, because of you, you will. The video features students acknowledging the role that Aboriginal women make in their community, including in the Catholic schools community of Wollongong. “Aboriginal and Torres Strait Islander women are strong. They fought and continue to fight for justice and equal rights, access to education and employment, to maintain and celebrate our histories, languages, music and arts, and for a better life and greater opportunities for our peoples, our families and our children,” the students say. “They’re our mothers and grandmothers, our Elders, our Aunties, our sisters and our daughters. “We honour the incredible Aboriginal and Torres Strait Islander women who have made and continue to make invaluable contributions to our nation and to Aboriginal and Torres Strait Islander education in Catholic Education in the Wollongong Diocese.